Urticaria is a Latin word that actually is the name of a plant called a stinging nettle. This plant when touched by humans, causes a stinging sensation at the point of contact. Urticaria are itchy raised, red welts on the surface of your skin that can appear anywhere on your body. They are usually brought on by an allergic reaction to food, medicine, sunlight or some other allergen. Urticaria is also more commonly known as hives and is curable 95% of the time with the right urticaria treatment. Urticaria is caused by your body having an allergic reaction to a foreign substance (or perceived foreign substance) and releasing histamine and other chemicals into your bloodstream to fight the allergen off. The histamine rushes to the area of contact and causes inflammation, red bumps, itching, swelling, and other symptoms. 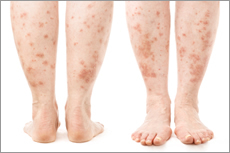 Urticaria is common in people with other allergies such as hay fever. Some people will have such a strong reaction that their faces start to swell up - especially the eyes, lips and ears. This swelling is commonly confused with urticaria, but is in fact a case of angioedema, which is swelling below the skin due to fluid being rushed to the area by your body to stop whatever is attacking / irritating your face. Angioedema swelling can also be seen on your feet, hands and throat. Itchy raised, red welts on the surface of your skin that can appear anywhere on your body. Skin may swell up into red or skin colored welts (known as wheals) with clearly defined edges. Wheals tend to appear out of nowhere and disappear just as quickly. Urticaria often grows larger, spreads from one area to another and can join together to form large areas of flat, raised irritated skin. Urticaria can change shape as the hives spread from one area to another. Urticaria can disappear and reappear within minutes, hours or days. Urticaria can turn from annoying to deadly if your throat swells up so much that you can no longer breath. The swelling is actually not caused by urticaria, but by angioedema, which can sometimes accompany an urticaria outbreak. If you feel that your breathing is becoming more and more restricted and that you may soon not be able to get any air into your lungs, you should call 911 immediately! Wheezing, fainting and tongue swelling also warrant a 911 call. How Do I Get Rid of Urticaria? Urticaria outbreaks have been known to come and go for more than a month, depending on if you get treatment or not. For the vast majority of our website visitors, the urticaria medication OxyHives works incredibly well. It has none of the harmful side effects other medications do and has proven to eliminate urticaria outbreaks. Doctors have been prescribing OxyHives for over 10 years now and have found it it to be one of the few over the counter medications that actually eliminates urticaria outbreaks. Learn more about OxyHives on our hives treatment page. In just over one percent of urticaria cases, a steroid is prescribed. You should seriously consider avoiding steroids these days due to their negative side effects: weight gain, jaundice, liver tumors, fluid retention and high blood pressure.